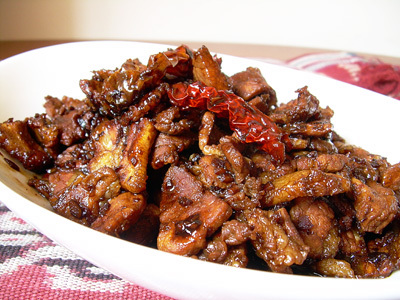 If you are looking for a delicious pork recipe which tastes sweet and hot, Chilli Pork might just be what you are looking for. Using dried chillis for a fiery taste and dark soya sauce, this dish is guaranteed to whet your appetite and make you ask for second helpings of rice. Best of all, it is a simple dish to cook and can be attempted by a beginner. I use pork belly for this recipe due to the texture of this part of the meat. Containing layers of fat and meat, each bite will give you a nice blend of slightly chewy meat in contrast with the smooth fat. No, it is not that healthy to be consuming this dish but once a fortnight or month should be fine. LOL! Again, just like the other recipes on this site, you don’t have to follow all the measurements of ingredients to the dot. If you like it more spicy, add more dried chillis or vice versa. Most of all, cook this and be blown away by its tastiness! Highly recommended! Heat oil in wok and saute dried chilli with garlic till aromatic. Before garlic turns brown, add sliced pork and stir well. Add sugar and dark soya sauce. Once pork is cooked on outer side, add water gradually (ensure that water continues to boil) followed by salt, pepper and chinese cooking wine. Cook till gravy reduced before dishing up. Gong Xi Gong Xi. Looks good, the pork, love that dried chili accent at the top. Rasa Malaysia : Thanks for the thumbs up on the picture presentation. You are my sifu mah! Thanks for this recipe! I tried it and it turned out fabulous! However, I substituted pork with chicken breasts, and due to the nature of chicken breasts, I sliced it thinly and then marinate with corn flour. The sauce went beautifully with rice! Thanks again. Omigosh, this looks so delicious!!! Am going to cook this tmw night for din-dins. I’m sure hubby is going to love it even as his tongue’s on fire, hehe.